Early Wynn Jr. (January 6, 1920 – April 4, 1999), nicknamed "Gus", was an American Major League Baseball (MLB) right-handed pitcher. He pitched for the Washington Senators, Cleveland Indians, and Chicago White Sox during his 23-year major league career. He was identified as one of the most intimidating pitchers in the game with his powerful fastball combined with a hard attitude towards batters. Wynn was inducted into the Baseball Hall of Fame in 1972. 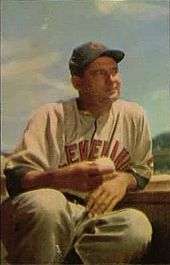 Wynn was a member of one of baseball's best pitching rotations along with Bob Feller, Mike Garcia, and Bob Lemon, while with the Indians in the mid-1950s. He won the 1959 Cy Young Award, beginning to rely on the knuckleball as the velocity of his pitches declined. Wynn retired in 1963. He finished with exactly 300 career wins; he had spent several months in pursuit of his 300th win. In 1958 Wynn became the first MLB pitcher to lead his league in strikeouts in consecutive years with different teams (184 with Cleveland, 189 with Chicago). He won the Cy Young Award in 1959 at the age of 39, posting a record of 22–10, with 179 strikeouts and a 3.16 ERA which helped lead the White Sox (sometimes called The Pale Hose) to the AL pennant championship. He was the third oldest MLB pitcher to win 20 games in a season, following Cy Young and Grover Cleveland Alexander. He also was the starting pitcher in the first of two All-Star Games held in 1959 (MLB held two All-Star Games from 1959 through 1962). Wynn returned to Cleveland in 1963 for a last run. In that season, he won his 300th game, after failing to collect the milestone win in seven starts over nine months in 1962–63. Both the timeframe and the number of attempts are the longest between any pitcher's 299th and 300th wins in MLB history. Opposing Kansas City batter Ed Charles recalled Wynn's 300th win: "His fastball, if it reached 80, that was stretching it. He was laboring, throwing nothing but bloopers and junk." From 1977 to 1980, he provided the color commentary for radio broadcasts of Toronto Blue Jays games, working alongside Tom Cheek. He also provided color commentary for Chicago White Sox radio broadcasts in 1982 and 1983. When he was replaced by Lorn Brown in December 1983, White Sox president Eddie Einhorn described Wynn as "a link to baseball's past." ↑ Lew Freedman (2009). Early Wynn, the Go-Go White Sox and the 1959 World Series. McFarland. p. 29. ISBN 0786455128. 1 2 Graham, Dillon (April 3, 1942). "Rookie sensation arrives at right time for Senators". Reading Eagle. Retrieved April 2, 2015. 1 2 3 Goldstein, Richard (April 6, 1999). "Early Wynn, Pitcher Who Won 300 Games, Dies at 79". The New York Times. Retrieved April 6, 2014. 1 2 3 4 Wancho, Joseph, Huhn, Rick, Levin, Leonard, Nowlin, Bill, Johnson, Steve (eds.) (2014). Pitching to the Pennant: The 1954 Cleveland Indians. University of Nebraska Press. pp. 185–189. ISBN 0803254717. 1 2 3 4 5 6 7 8 9 "Early Wynn Statistics and History". Baseball-Reference.com. Retrieved April 6, 2014. ↑ "Wynn on way home". Reading Eagle. June 13, 1946. Retrieved April 2, 2015. ↑ "Early Wynn hopes to join Senators". Pittsburgh Press. June 13, 1946. Retrieved April 6, 2014. ↑ Armour, Mark (2010). Joe Cronin: A Life in Baseball. University of Nebraska Press. p. 191. ISBN 0803229968. ↑ Malcolm, Andrew (December 4, 1985). "Benefit for 'Big Bear' of 50's brings bittersweet reunion". The New York Times. Retrieved April 6, 2014. ↑ "1954 World Series". Baseball-Reference.com. Retrieved April 6, 2014. ↑ "Wynn hurls first 1955 win as Indians beat Bosox". Daytona Beach Morning Journal. May 3, 1955. Retrieved April 2, 2015. 1 2 Purdy, Dennis (2006). The Team-By-Team Encyclopedia of Major League Baseball. Workman Publishing Company. p. 360. ISBN 0761153764. ↑ Bierman, Fred (May 2, 2009). "One-Man Show". The New York Times. ↑ Donnelly, Patrick. SportsData LLC. (2012). Midsummer Classics: Celebrating MLB's All-Star Game. 1959–1962: "all players who were named to the AL or NL roster were credited with one appearance per season" http://www.sportsdatallc.com/2012/07/09/midsummer-classics-celebrating-mlbs-all-star-game. SportsData http://www.sportsdatallc.com. April 16, 2015. ↑ "Knuckle ball putting Early Wynn back in top ranking". Prescott Evening Courier. June 18, 1959. Retrieved April 6, 2014. ↑ Donnelly, Patrick. SportsData LLC. (2012). Midsummer Classics: Celebrating MLB's All-Star Game. 1959–1962: "all players who were named to the AL or NL roster were credited with one appearance per season" http://www.sportsdatallc.com/2012/07/09/midsummer-classics-celebrating-mlbs-all-star-game. SportsData http://www.sportsdatallc.com. Retrieved April 18, 2015. ↑ Vecsey, George (August 5, 2007). "Sports of the Times; Chasing No. 300, Yesterday, Today, Tomorrow". The New York Times. Retrieved September 20, 2013. 1 2 Mooshil, Joe (May 6, 1982). "Early Wynn Not Proud of 300th Win". Times-Union. Retrieved September 20, 2013. ↑ "Early Wynn May Try Comeback". Reading Eagle. August 9, 1965. Retrieved September 21, 2013. ↑ "Twins Name Early Wynn Mound Coach". Sarasota Herald-Tribune. October 16, 1966. Retrieved September 21, 2013. ↑ "Hall of Fame pitcher Early Wynn dies at 79". Los Angeles Times. April 6, 1999. Retrieved April 6, 2014. ↑ "Early Wynn Won't Pitch". Lawrence Journal-World. September 18, 1972. Retrieved September 21, 2013. ↑ "Will Early Wynn Take Hill Again?". Lawrence Journal-World. August 15, 1970. Retrieved September 21, 2013. ↑ "Chisox replace Early Wynn". Ottawa Citizen. December 5, 1983. Retrieved September 21, 2013. ↑ Breslin, James (April 5, 1963). "The old Indian's last stand". Life. Retrieved April 6, 2014. ↑ Rathet, Mike (January 20, 1972). "Sandy Koufax, Yogi Berra, Early Wynn Picked for Baseball Hall of Fame". Youngstown Vindicator. Retrieved September 20, 2013. ↑ "Hall of Famer dies at age 79". The Victoria Advocate. April 6, 1999. Retrieved September 21, 2013. ↑ "Pitcher Early Wynn Dead at 79". The Nevada Daily Mail. April 7, 1999. Retrieved September 21, 2013. ↑ "100 Greatest Baseball Players by The Sporting News : A Legendary List by Baseball Almanac.". Baseball-almanac.com. Retrieved 2013-03-27. ↑ Bruce Nash and Allan Zullo, The Baseball Hall of Shame 2, page 124 (1986). ↑ Roger Kahn, Golden Triumphs, Tarnished Dreams, Sports Illustrated (August 30, 1976). Retrieved on April 17, 2012. ↑ Nash and Zullo, supra, at page 123. In Roger Kahn's version of the incident, the knockdown pitch occurred after Joe hit one long drive, and Wynn then said to his son, "You shouldn't crowd me." See Roger Kahn, Golden Triumphs, Tarnished Dreams, Sports Illustrated (August 30, 1976). Retrieved on April 17, 2012. ↑ Nash and Zullo, supra, at page 123.